The major headline on most of the tabloid newspapers is the rise in energy bills that will hit us this Autumn/Winter. This is bad news for those of us trying to keep our bills as low as possible it seems like we a facing an uphill battle. The Guardian has commented that electricity prices are expected to rise as much as 30%, this article can be seen here. It is all well knowing that swapping to a lower wattage bulb will save you money on your bills, however it is less known exactly how much it will save. 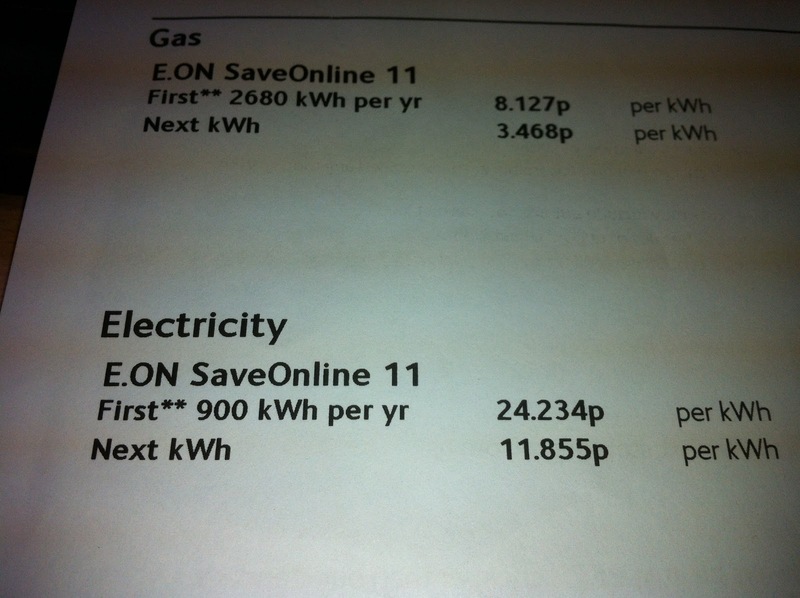 Our annual Energy Bill has just been renewed so we thought we would compare how much money a low energy bulb would save. The picture below shows the price per KiloWatt hour on our particular price plan. Obviously everybodys price plan is different however this will give you an idea of how much electricity actually costs and how much can be saved by swapping to low energy bulbs. Here we can see that there are two different prices, the amount for the first 900 kilowatt hours and then the price after this amount. The prices are excluding VAT so an extra 5% would be added to these prices. 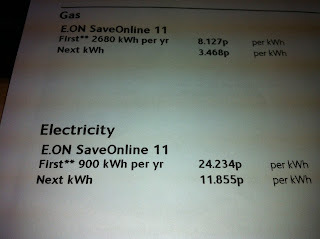 For the purposes of this blog we will use the amount it costs for the first 900 kWh to base our costs on. The particular light bulbs we will use to compare the low energy and halogen versions are GU10 light bulbs which can be found in a wide range of spotlights and recessed ceiling lights. Most households will have at least one fitting with these bulbs in, and many new properties will have a huge amount of them for use in most rooms. After the first 900kWh have been reached, the prices of the following comparisons will then be halved. ﻿﻿﻿On the left we can see two types of GU10 bulbs. The first being the 4 Watt LED version which is exactly the same size as the halogen lamp but looks slightly more futuristic. When the bulb is actually inside the light fitting the only part of the bulb would would see if the front part. These bulbs are designed to last up to 30,000 hours which means they are perfect for light fittings in hard to reach places or somewhere where it may be difficult to access to change the bulb. Below the LED bulb we can see the standard halogen one that most people have had in their homes for over a decade. These lamps use 50 Watts of power and become extremely hot. This can often lead rooms to becoming very hot in the summer as halogens waste a lot of energy on heat. The heat is also a problem when these lights are installed into recessed downlights as a build up of heat can often cause the bulb to blow prematurely which means another trip back to the shops. With the average life of a Halogen between 2000-4000 hours there is not much comparison to the huge 30,000 hours that LED bulbs last. The way of working out how much electricity costs you can be varied however we will use the easy way of imagining we have 10 downlights running on one circuit. Many new houses have these in the lounge/bedroom which means when you turn your bedroom lights on you have 10 bulbs running together to give you the light for your room. In some houses the amount of downlights can be split up ie. 4 in the bathroom, 4 in the lounge, 2 in the utility etc. 10 is a nice round number which should be able to make it easier to calculate the total cost. If we have 10 fittings with a 50 Watt bulb in each one and these are left on for one hour it would use 500 Watts of energy per hour. This equates to exactly half a kilowatt, therefore costing us 12 pence every hour. Now lets imagine a typical winter day, the lights are switched on from 7am-9am in the case of somebody working close to home. Then at 5:30pm we arrive home in the dark and the lights go back on until 11:30pm when everybody has gone to bed. Taking this into account the usage is 8 hours and as previously discovered every hour costs 12 pence. Therefore for 8 hours usage per day it is costing 96 pence. Obviously on weekends this will be more, especially on long dark days. So for a Saturday which is cloudy and raining the lights may be on from 7am-11pm, this could be costing £1.92 just for these! The above calculation is not the whole electricity bill for one day, it is just for these 10 spotlights. When you add into the equation a TV, Fridge Freezer, Microwave, Kettle, Electric Oven and Washing Machine, the price is becoming much higher. Realistically you would not be able to cut the costs of domestic appliances massively so the only real way is the light bulbs you are using. Next we will compare LED's to see how much we will save with the newer technology. LED bulbs lose very little energy in the way of heat, making them much more efficient. They also last longer and use a huge amount less electricity that halogens. It is true that they do cost slightly more upfront, however as demonstrated above halogens use an awful lot of energy which in the long term will cost a lot of money. We will use the same scenario as with the halogen lights. An average working winter day with 8 hours usage. Each of the lights are now only 4 Watts, therefore the usage will be 40 Watts per hour. The wattage used per hour has been reduced by 92% and is now only costing 0.0096 (just under 1 pence per hour). On a working day when we use 8 hours electricity, the cost is now only 0.0768 (just under 8 pence per day). To put it into context, we could leave the LED bulbs on for 12 hours constantly and this would cost as much as leaving the 50 Watt halogens on for one hour! As mentioned previously, on a long dark Saturday the cost of having the LED bulbs on from 7am-11pm would only be 15 pence. We have seen that there is a considerable saving to be made by switching to LED bulbs and the saving is instant. Just to re-cap the below text contains the comparisons between the LED GU10 bulbs and the Halogen light bulbs. If you would like any more information then please just ask. Our blog tends to concentrate on energy efficient lighting issues but we also like to read similar interesting blogs that focus on greener living as well. Earlier this evening I came across this useful blog Making your home greener by allrenewables that focussed on general tips for energy saving around the home and it got me thinking about the simple things that we can do that could make all the difference to your energy bills & your carbon footprint. As I read the blog I started to look at the lighting I had in my lounge & dining room. It became clear quite quickly that each different light had a very different role to play from each other. There is a standing lamp in the corner of the lounge (loaded with a low energy cfl lamp) & a halogen ceiling light. As we like ambient light in our living room we usually opt for the standing lamp to be illuminated to give us a warm glow where as the ceiling light is rarely used. In the dining room we have 4 low energy cfl downlights in the ceiling and 2 LED GU10 picture lights on the wall. If we analysed these 4 types of light we can deduce that the standard lamp is used to provide an overall light and is active for most of the evening, where as the ceiling light is off. The picture lights are active for most of the evening and provide more ambient light, but the downlights are off unless we are eating at the table. The light fittings that are used for large amounts of time have low energy lamps in them where as the occasional lights tend to have the costly halogens. This makes complete sense. The same would apply to areas like bathrooms or landings if they need to be illuminated throughout the night. I guess the point I am trying to make in this short post is that you don't have to try & save the world by changing every light in your home to a low energy version. But making the smart choice and changing just a few key ones could make all the difference!